Arnhem Land is an Aboriginal homeland sacred to its people. This is a revered and large space east of Darwin in the Northern Territory, which has a rich history that should be honoured by all of those who visit this sacred land. This land has been habituated by those with the oldest living cultural history in the world, of well over 5,000 years. Arnhem land has a wide variety of cultural activities to enlighten and educate any visitors wishing to learn more about aboriginal culture. One of the reasons why Arnhem Land is considered sacred is on account of the fact that this geographical space has been the square destination for aboriginals to pass down cultural traditions to the next generation. This hub for cultural tradition is largely located within the Northern Territory, and occupies approximately 97,000 square kilometers of space. It’s not surprising then that it is home to many spectacular landscapes! Rich with beautiful forests and rivers, the Arnhem Land is a perfect location for anybody itching to escape the concrete jungle of the city and explore Australia’s true outback heart. The Arnhem Lands are filled with many national parks that both honour and celebrate ancient aboriginal culture, with many national parks including countless homages. The rock engravings and artworks adorning the national parks with the Arnhem Lands really make a visitors develop a genuine sense of kinship and appreciation for the land. These national parks also bear sincere significance on account the Dreaming stories associated with these public sites. Through the acknowledgement of the intrinsic relationships between the aboriginals and the Arnhem Lands, this space really provides a remote haven and one of the dramatic sea changes any tourist could ask for. Alongside the national parks, another key aspect of the Arnhem Lands includes the visual arts presented within this sector of Australia. With art being presented within ancient and contemporary formats, the Arnhem Lands present a plethora of cultural works celebrating the landscape that surrounds it. Considering that a quarter of Australia’s Indigenous population are artistically active, it is little wonder why so much art is founded within this area. Many of the artworks featured within the Arnhem Lands are largely based off cultural material from Indigenous Australians and are somewhat inspired by the Papunya Tula Art Movement. Alongside the great art and natural features that are found within the Arnhem Lands, there are also a large variety of historical sites, rich with significance. One example of this can be seen within the Garig Gunak Barlu National Park within remote Cobourg Peninsula. This remote section of Australia is home to some of the ruins of early European settlers, with evidence of settlements within this land, it is clear to see just how culturally rich it was. The Arnhem Land is a great area that is home to countless forests and spectacular rivers and gorges east of the Northern Territory capital of Darwin. 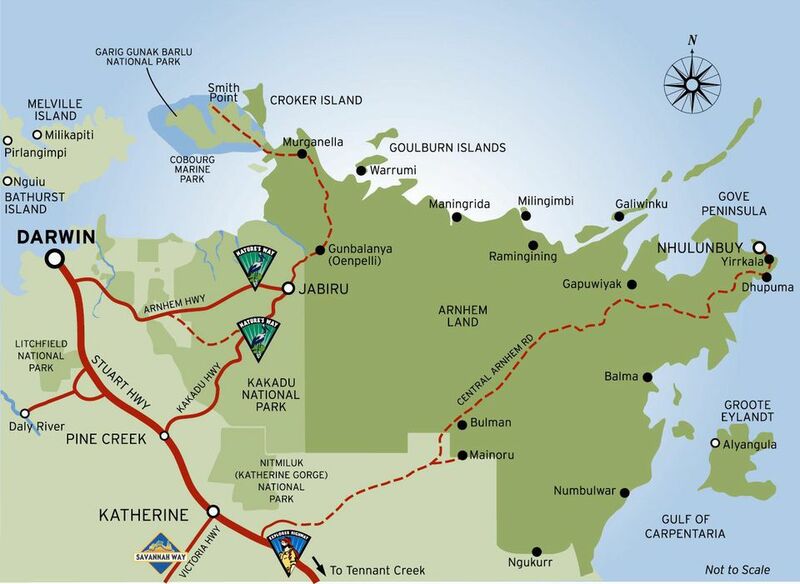 However when visiting areas such as Kakadu and venture east to Ubirr have only to look farther east beyond the East Alligator River to where Arnhem Land begins, and no non-Aboriginal person is allowed without express permission.